20" x 45" x 22"
The bench "Quarrel" is captures a human emotional situation as a tangible, physical posture. This two-seater bench is a twist on the traditional loveseat as the site for argument or impasse. The bench becomes an illustration of the quarrel itself: each individual seat is simultaneously turning away and yet inexorably intertwined with the other seat. Among the most basic traits shared by living organisms are that of nearly perfect symmetry, and so it is with the seats. As with all animals, starting at the stage of cells dividing, the two seats look similar at a distance but are actually slightly different shapes and sizes, showing variation within their species. 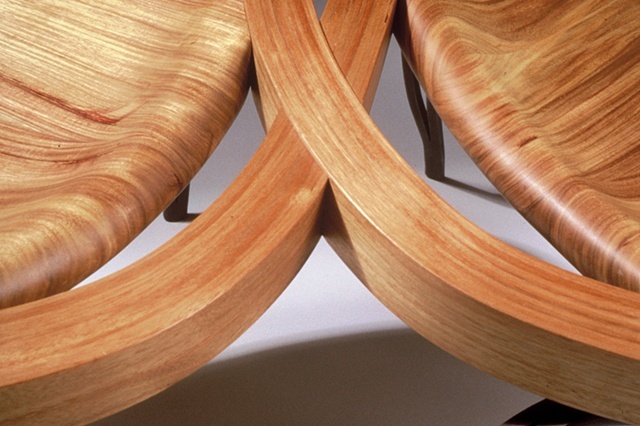 "Quarrel" is made from solid and bent laminated Canary wood. The cross joint in the rails is a curved half-lap joint. The steel legs are hand forged and welded.